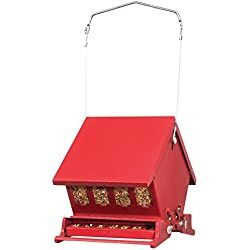 Let’s dig in and learn about the best backyard bird feeders and feeding stations in this best bird feeders reviews page. BUT – What kind of bird feeder do you need to buy? It’s pretty much the perfect backyard bird feeder for all yards – it attracts the most beautiful birds! I can watch them for hours. What type of birds are native to my area? What type of birds do I want to attract? 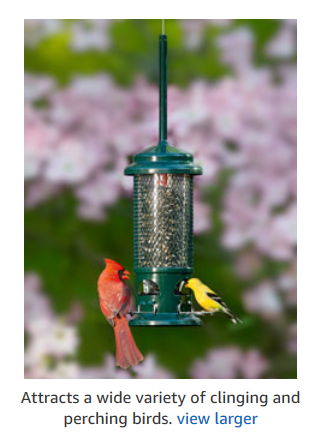 Let’s look at the type of bird feeders available and the types of birds each feeder attracts. 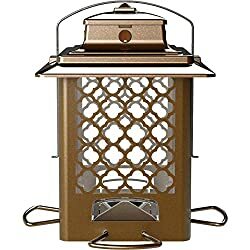 That page is filtered to only show you the very best-rated backyard bird feeders to make picking the right one for YOU super easy. 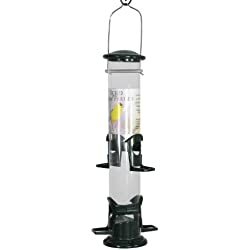 When it comes to the best all-around bird feeder that is wonderful for attracting all types of beautiful birds to your yard, this “squirrel buster’ bird feeder is an excellent backyard feeder. 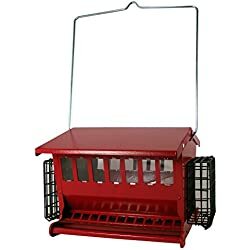 It’s very easy to fill (and to clean when needed), it’s Squirrel PROOF, has it’s own special “seed saver technology”, is weight adjustable so you can set it for bigger birds or only for smaller birds, and the design allows for good air flow to keep the seed fresh and healthy for your backyard birds. AND, the price is always great… very affordable, in my opinion. 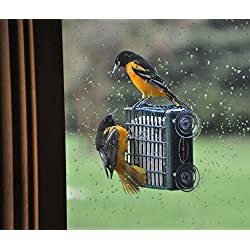 Not only do we agree that it’s a great bird feeder, but so do all the reviews of this bird feeder as well as the ratings from our own readers. 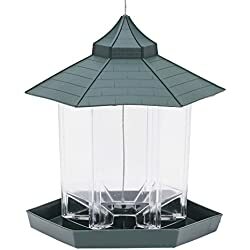 What Birds Do Platform Bird Feeders Attract? 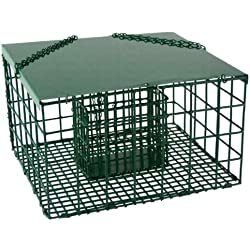 Can You Squirrel Proof a Platform Feeder? What Types of Birds Do Tube Bird Feeders Attract? 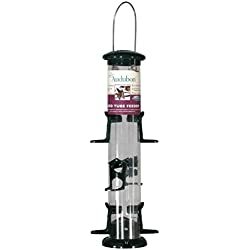 Will Large Birds Use a Tube Feeder? What Types of Bird Seed Do You Put in a Tube Feeder? What Type of Birds Will a Globe Bird Feeder Attract? 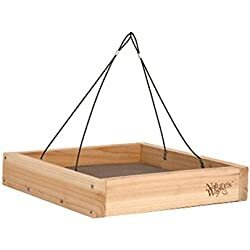 The Platform Bird Feeder is basically a tray and will attract a large number of birds both large and small. 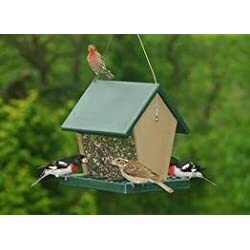 This type of bird feeder will also give the most unobstructed view of the birds. The versatility of platform feeders is one reason they attract such a large variety of birds. They can be placed on or near the ground, placed on a pole or hung from a tree. In fact, they can even be placed under another feeder to catch the falling seed. Platform feeders are difficult to squirrel proof. At best they can be made squirrel resistant. Some platform feeders have roofs that make it difficult for squirrels to enter the feeder. 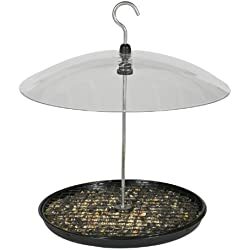 Others have a grate that fits over the birdseed and squirrels and other critters have a difficult time getting to the food. All platform feeders must have drainage holes, generally a grate in the bottom, to allow rain water to drain out. If snow or sleet are a part of your Winter weather, you should consider a platform feeder with a roof. Some platform feeders, known as fly through feeders, have a built in roof. 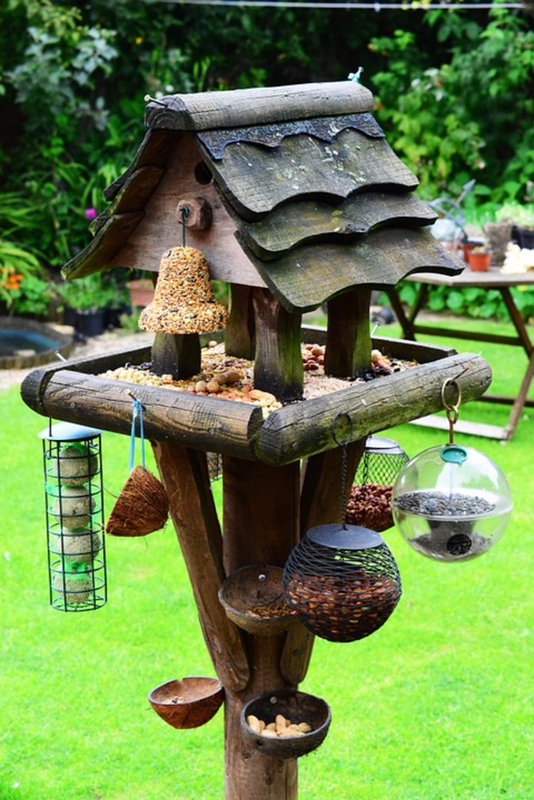 You can also purchase a roof to fit over your bird feeder. 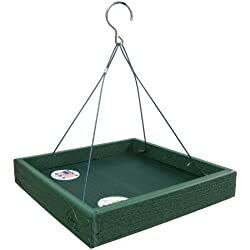 For a wide variety of birds you can’t beat a platform feeder. Hopper feeders are larger bird feeders and very “bird-friendly”, especially to large birds. Big birds like jays and woodpeckers are able to land on a hopper feeder and feed easily. In general, hopper feeders hold more bird seed than other feeders. Therefore, you don’t need to refill them as often. They can also be very decorative, looking like a barn or a chalet. 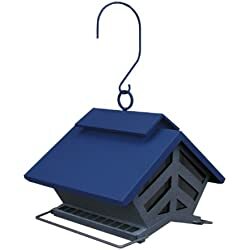 They frequently have suet feeders attached and this can increase the types of birds coming to eat. Squirrel proofing these feeders can be accomplished by a counter-balance system that closes the seed opening when a squirrel gets on the feeder. Tube feeders are the feeders seen most often in backyards. They are long tubes with feeding ports located along and around the tube and have short perches. Larger birds cannot use the short perches. Some tube feeders come with a cardinal ring or longer or lower perches to allow cardinals and grosbeaks to feed at them. What Bird Feeder Works Best for Cardinals? Be certain that the seed you use is compatible with the seed ports (the openings in the feeder). Note: Sunflower seeds will not work in a nyger feeder. The seed in these tube feeders are protected from the weather so rain, snow and sleet can’t get at the food. Tube feeders can be made squirrel proof in general by using the weight of the squirrel to close off the seed ports. Some tube feeders even have computer operated programs that realize when a squirrel is on the feeder and twirls or tips him off. Globe feeders are not as common as the other feeders. 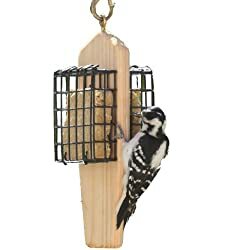 Globe bird feeders are best for attracting small birds like chickadees, nuthatches, goldfinches and titmice. They look somewhat like a clear ball hanging in your tree. They are sometimes called satellite feeders because they look like satellites. They are perchless and the birds must cling to the bottom in order to eat. Globe feeders generally hang from a wire and spin when a bird lands on it. 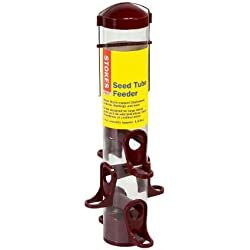 You can use any of a number of types of seeds or seed mixtures in this feeder. 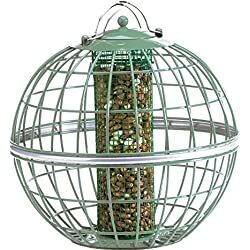 Since this type of feeder is enclosed, the seed is protected by the elements. 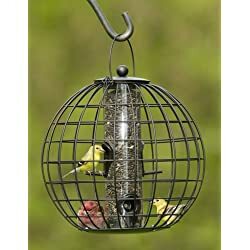 Globe bird feeders are squirrel resistant because squirrels have a difficult time hanging on the feeder. 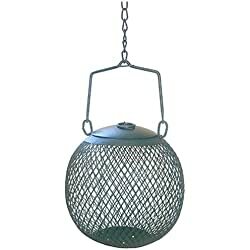 A baffle can be added above the feeder and squirrels are generally deterred from coming to this type of feeder. Suet is a wonderful addition to your bird feeding regime. Suet contains energy rich nutrients and has a high fat content which is both nutritious and delicious to birds. Most birds will eat suet if they need additional energy but woodpeckers, goldfinches, bluebirds, and juncos love suet. Suet feeders are simply wire cages into which a suet cake is slipped. 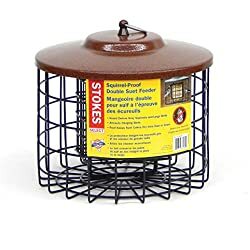 Squirrels and other critters like suet too so you may want to add a baffle to deter the squirrels. There are squirrel proof suet feeders which have an extra cage around the suet feeder. Suet may also be fed in a feeder with the opening on the bottom. Most birds will eat upside down but starlings and squirrels will not as a general rule, but I’ve sure seen some upside-down eating squirrels in MY backyard!. Birds will eat suet that contains pepper but squirrels will not. 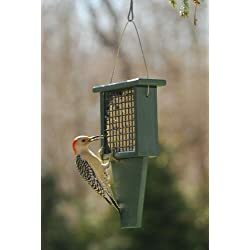 Suet feeders are frequently attached to the side of hopper feeders or other bird feeders. 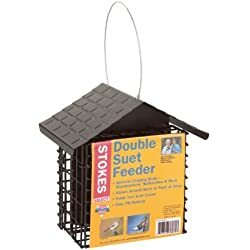 Suet feeders can be hung from the bottom of another feeder. There are few things more pleasurable than sitting in your house or your yard watching birds flock to your bird feeders. The variety of birds is so very interesting and knowing that you have made them welcome in your yard brings a sense of contentment. Next Next post: Backyard Bird Bath Tips – Do You Need a Bird Bath in Your Yard?